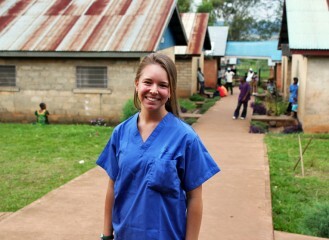 Elise Cegielski is a communications intern for Samaritan’s Purse in the Democratic Republic of the Congo. Brilliant hues and patterns of Congolese cloth swirled around us as the ladies encircled our Land Cruiser. This was it—I was on the field at last. A chant-like song erupted from the gathered crowd, and as our feet touched the dusty earth, dauntless smiles lit up every face. The mothers moved along in procession toward a meeting circle with their infant babies swathed to their backs to welcome us to their village. That morning, armed with my DSLR and telephoto lens, I set out in high spirits. Being a photojournalist has always been my dream, and this was my first test on the field. I was shadowing a videographer from the Samaritan’s Purse office in the UK, documenting one of our maternal child health projects, and when he asked me to be the stand-in photographer, I couldn’t think of a higher honor. 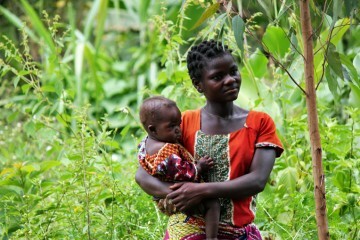 Women in eastern Democratic Republic of the Congo often greet their visitors with song and dance. Our assignment was to capture what village life is like for women at two care groups where mothers were being taught about health and nutrition. We followed the singing women to their gathering circle, trailed by countless wide-eyed and giggling kids. My breath was taken away by the beauty of the moment, and my creative mind was figuring out how to best capture and convey all that was going on. We all sat down in a large circle, introductions were said, their meeting began, and all the while I was supposed to be getting to work. The videographer was already having a field day, going around with his massive lens, walking right through the middle of the circle and up into people’s personal space. Pensive mothers, curious children, clinging babies, and close-up faces—he was getting exactly what people wanted to see. But I was frozen. Somber eyes followed me wherever I moved. I felt like I was intruding on their meeting—on their life. What right did I—the cheeky white girl with the expensive piece of technology clutched in her hands—have to get up in their faces and steal a snapshot of eyes that had seen more horror than I could ever imagine? I slowly started using my telephoto lens like a sniper from afar, creeping around the outskirts of the circle. Eventually, I went to walk around the village by myself. Houses. Fields. This I could handle. I was snapping away when I rounded a corner and a deep resonant noise accosted me. There was a grave just yards away from the mud house: a fresh red earth mound covered in tiny flowers with a roughhewn wooden cross at the base. A woman knelt in the dirt, uttering a flow of prayers, woes, and sobs, head bent to the grave. Was it rebel violence? Starvation? A sickness that didn’t have to be fatal? 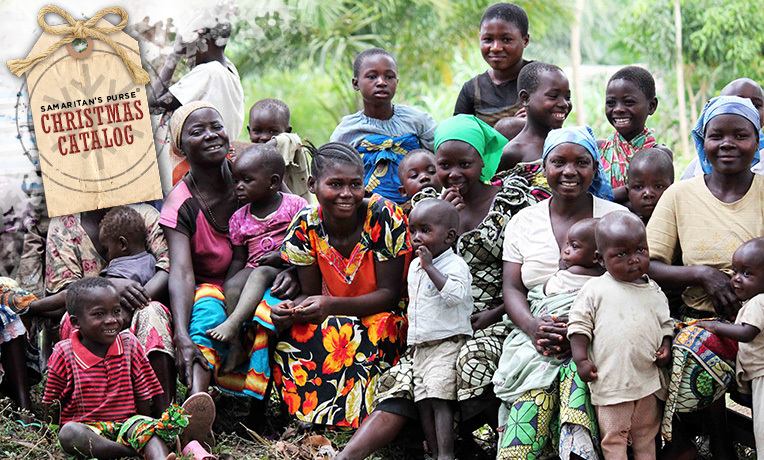 Samaritan’s Purse staff members taught the mothers at the care group about health and nutrition for their babies. I left my lens at my side and walked on. That heartbreakingly sacred and private moment was not for me to capture. I could do nothing for these people; the last thing I wanted was to betray their gift of allowing me to witness reality. A couple of days after my unfortunate bout with a local flu, I geared up for the second half of my field assignment. Maybe I could redeem myself yet. In the same area, two World Medical Mission doctors were based in a Congolese Christian hospital, and I was asked to write a story about their work. People travel hundreds of miles from all over the eastern part of the country just to reach this place. I trekked over to the hospital, boldly threw on scrubs, and entered the operating room to shadow Dr. Warren Cooper. He was in the middle of a leg reconstruction and skin graft on a woman who was in a motorcycle accident. Elise had the opportunity to visit multiple projects while she was in the field. This was going to be an intense series of photos. My camera went up to eye level, zoom fully extended, and I noticed I was a little lightheaded. I’ve never been squeamish around blood, but I had never been in the operating room before either. The next thing I knew, the world had gone unstable around me and I was seconds from hitting the blood-spattered floor. I made it out of the room just in time to reach a chair. It was just not my week. Later on, I joined Dr. Cooper for daily consultations. I didn’t know if I could bring myself to photograph the mother whose little girl was just confirmed to have both Down syndrome and a heart condition, the man diagnosed with prostate cancer, the man whose foot may have to be amputated, or the woman who may never have children. I simultaneously felt heartbroken and like the most incompetent photojournalist ever. 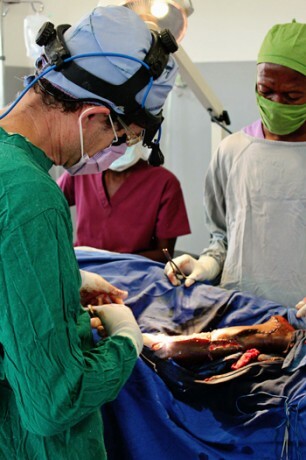 Dr. Cooper is a post-resident with World Medical Mission, the medical branch of Samaritan’s Purse. Jesus’ world of political and religious instability, filled with poverty and disease, would probably be a prime target for both relief and news agents today. Yet Jesus dared to walk into every raw, dangerous, and messy situation. There was no pain that left Jesus unmoved. Jesus wept. Jesus touched lepers. Jesus fled violence. Jesus ate with social outcasts. Jesus was not on assignment from the boss to go and scope out the situation down on earth and bring back the story with nothing to offer its characters. He was sent to rewrite the story. 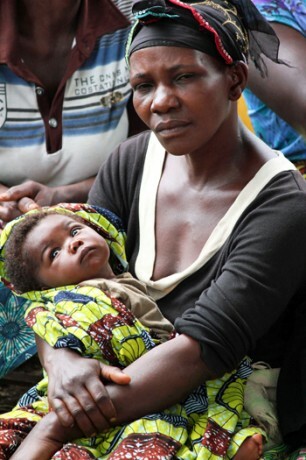 I might not have much to offer conflict-displaced people of Eastern Congo, but Jesus does. And while I hope to grow in both confidence and humility in my photography, I need to always remember that God is the one offering hope. I am merely to carry people to His feet. We can approach Him with confidence because He bore every single one of our burdens—fear, sorrow, sickness, and trauma. We don’t serve a high priest who is unable to sympathize. He’s been there.